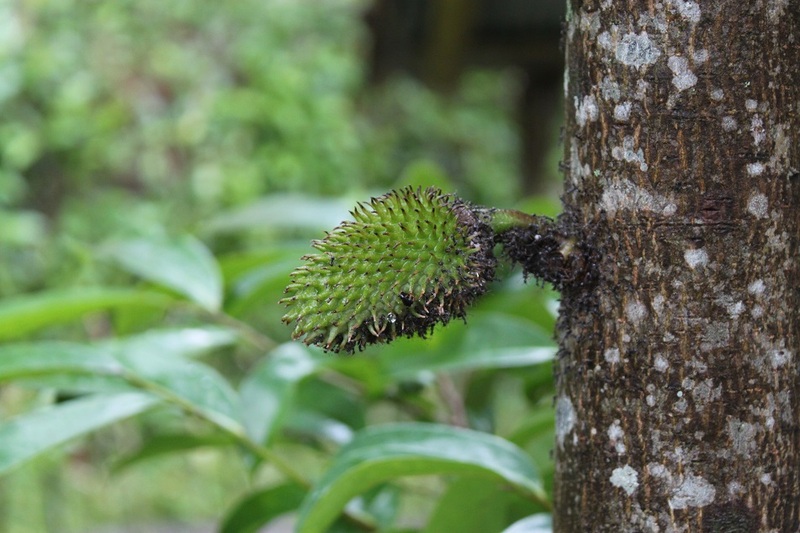 Batukaru: Sight, Sound, Taste | What an Amazing World! Gede keeps driving on a seemingly endless village road, until he suddenly makes a turn to an even narrower one-car-only road. 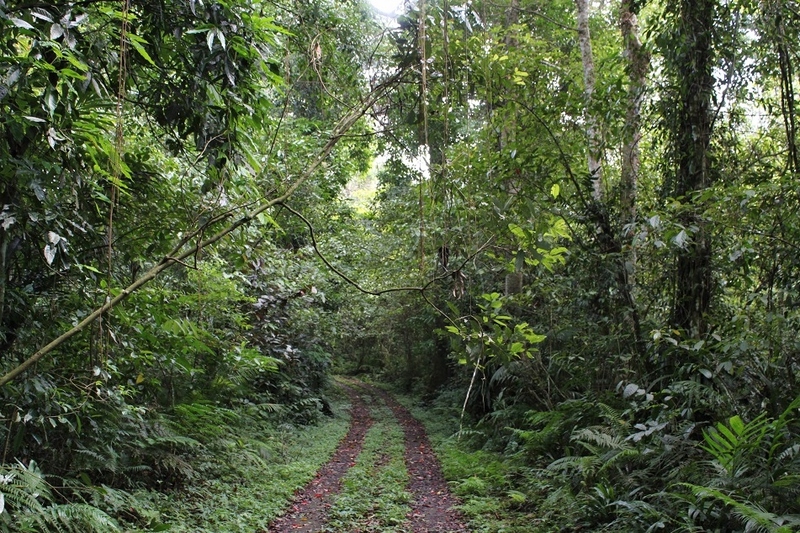 He continues driving at a low, constant speed, making sure the car’s tires stay on two cemented paths, which at some parts look rather slippery, that go deep into the dense foliage of the verdant valley. But our car is just a minivan, more appropriate for city streets than difficult roads. 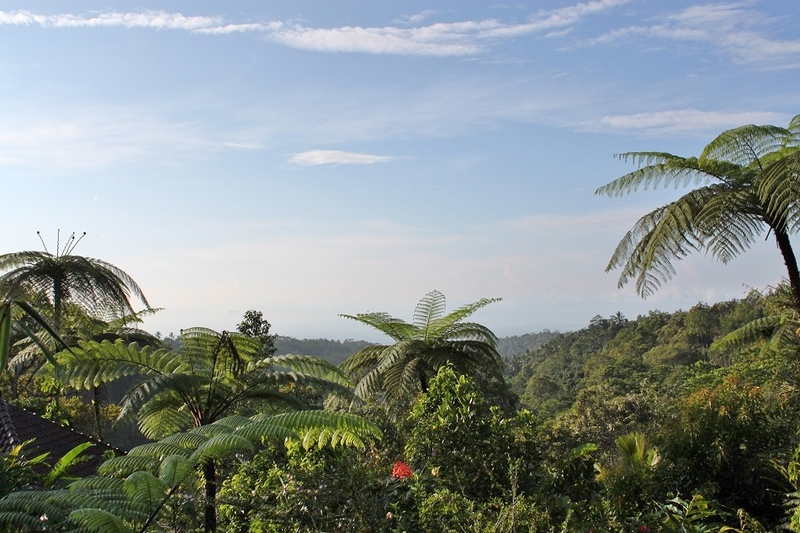 Just past lunchtime I heave a sigh of relief as we finally arrive at an eco-lodge in the village of Sarinbuana, virtually surrounded by pristine forests with only a small number of villagers’ houses at sight. It is here where we will spend the next two nights and find out what this peaceful remote corner of the island has to offer. Within a short walk distance from the eco-lodge is the entrance way to the village’s subak temple, an uphill moss-covered pathway leading to a small temple dedicated to the fertility gods and goddesses. A signboard stands at the mouth of the leafy path with photos of the wild animals spotted in the rainforest, home to some of Bali’s most endangered species. Wayan, our guide, works on rice fields as a farmer when there is no tourist. He used to work at Kuta, but returning to his native Batukaru region, he says, brings peace to him. Not only tourists alike, he has also taken researchers to the woods which helped him understand better the rich diversity of flora and fauna within the forest proper. However the only sound we hear during the first half of the hike comes from our own footsteps and camera shutters. Wayan introduced to James and I some of the forest’s unique treasures. 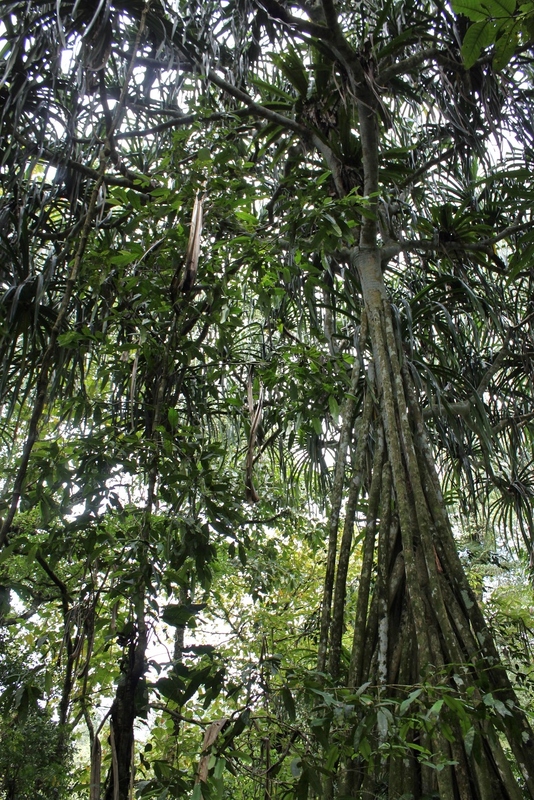 Growing among other trees, giant pandanus trees dwarf us as we get off the trail and draw ourselves closer to them to truly appreciate their enormity, more fitting for the time when dinosaurs still dominated the planet. 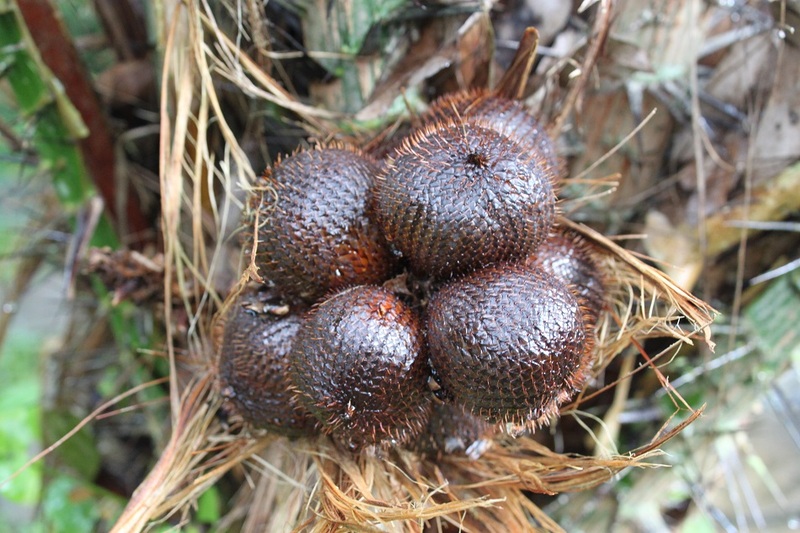 Another bizarre plant we find is spider fern, whose bud grows at the tip of a leaf for a maximum exposure to sunlight. 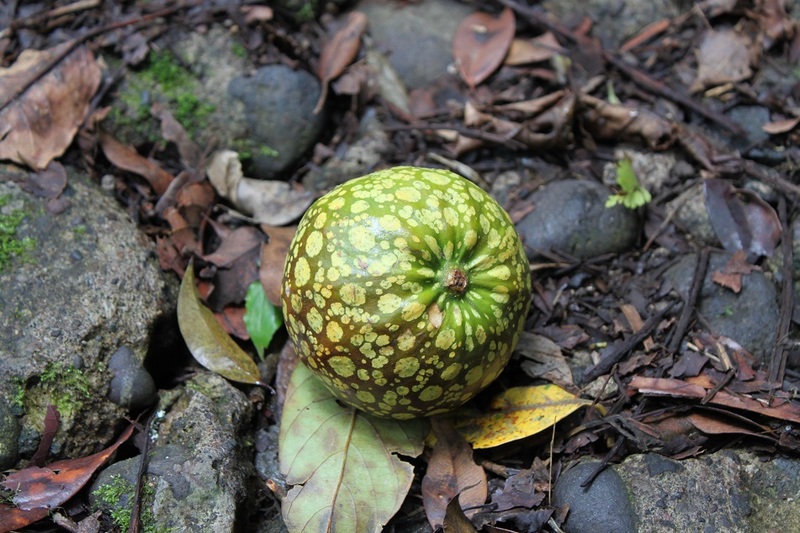 Every now and then Wayan stops and takes random wild fruits, from trees as well as the undergrowth. With his Swiss army knife he skillfully cuts a forest fig in half, then shows its inner parts to us. Also he cuts another round inedible fruit to reveal what’s inside the thick skin. His love of nature is palpable from his excitement in telling us as many things about the forest as he knows, albeit occasionally the amount of information is too much to absorb. 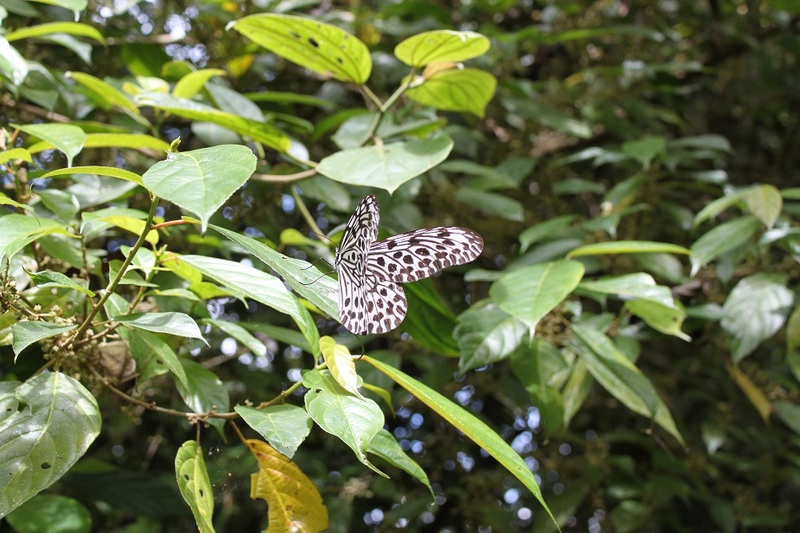 Just as we think we would not see any animals, a big butterfly flies right in front of us, its white wings speckled with black dots and lines. It is one of the biggest butterflies I have ever seen in my life, yet it flaps its wings so gently, indifferent to the human presence a few meters away. 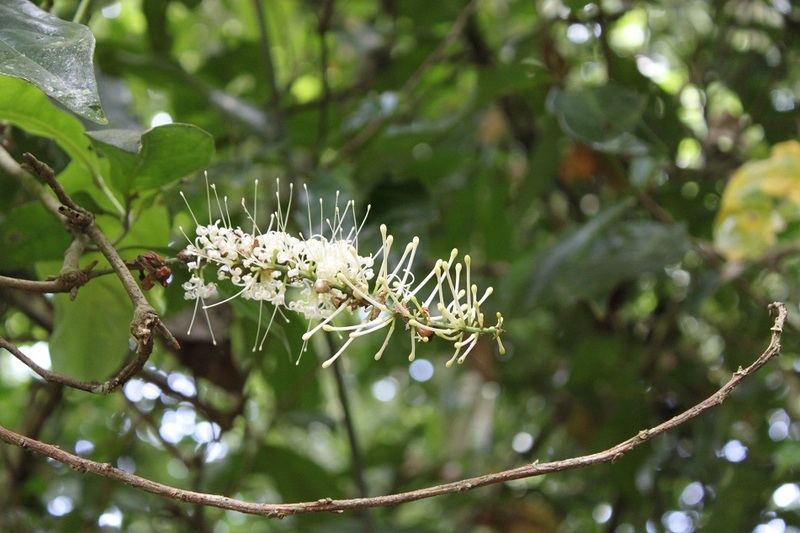 Later we learn it is the Malabar tree-nymph, native to India but found in abundance at the slopes of Mount Batukaru. Not long afterwards the forest canopy comes into an impromptu riot. 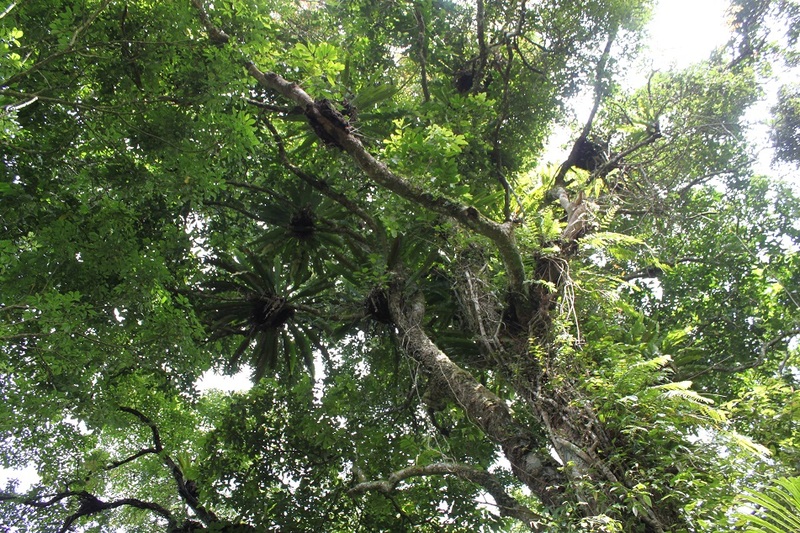 Twigs and branches high up there shake, plausibly caused by a bird or two with considerable size. Is it a pigeon? Is it an eagle? We cannot tell for the forest’s dense leafy world of overlapping branches and leaves obstructs our view of the bird. Then there are leeches, squiggling on the wet stone track waiting patiently for an unassuming human to cross its path. Me. Contrary to what I always imagined, leech bite in fact does not feel painful at all, only a slight tingling sensation on the patch of skin where the leech dangles. As we arrive at the overgrown temple grounds, an inquisitive male macaque jumps off a tree, then strides across the bushes before coming up to the same pavilion where we are sitting to take a break from the hike. Wayan knows the monkey very well and he opens his small backpack to show the curious company that there is nothing he can steal from us. As clouds gather in the sky, we get ready to walk back to our lodge. We go through the same route, but midway the downhill path Wayan asks us if we want to take a shortcut which apparently takes us through a dirt track where cocoa trees grow along the way. 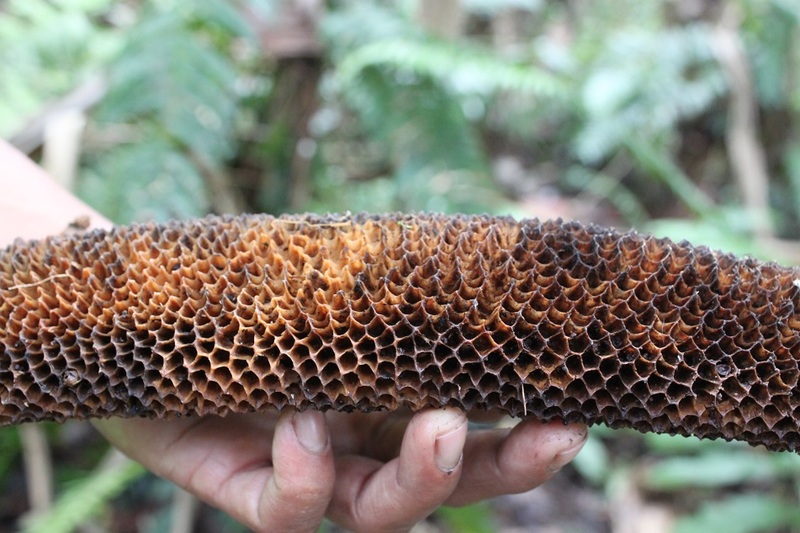 Wayan stops near one of the trees, takes a cocoa pod, and cuts it in half to reveal the white beans, each covered in sweet white soft pulp. 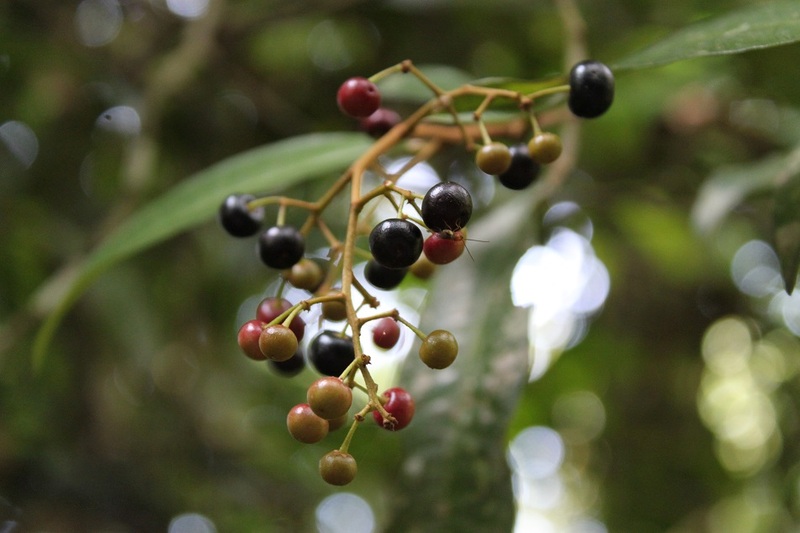 The eco-lodge itself is home to a plethora of fruit trees and medicinal shrubs. Just outside our two-storey bungalow an avocado tree grows on a hillside while closer to the restaurant a cornucopia of plants thrive in the fertile volcanic soil, including mangosteen, soursop, passionfruit, chili, cucumber, lettuce, pepper, vanilla, durian, pomelo, dill, galangal, and pretty much everything else the restaurant needs for its mostly vegan-friendly meals. At the restaurant a small chalkboard describes the homemade vegan desserts available: non-dairy chocolate mousse, coconut-based ‘cheesecake’, and ice cream with salak crumble. “We make everything from what we can find in the gardens,” says Iluh, the cordial restaurant staff and cook. 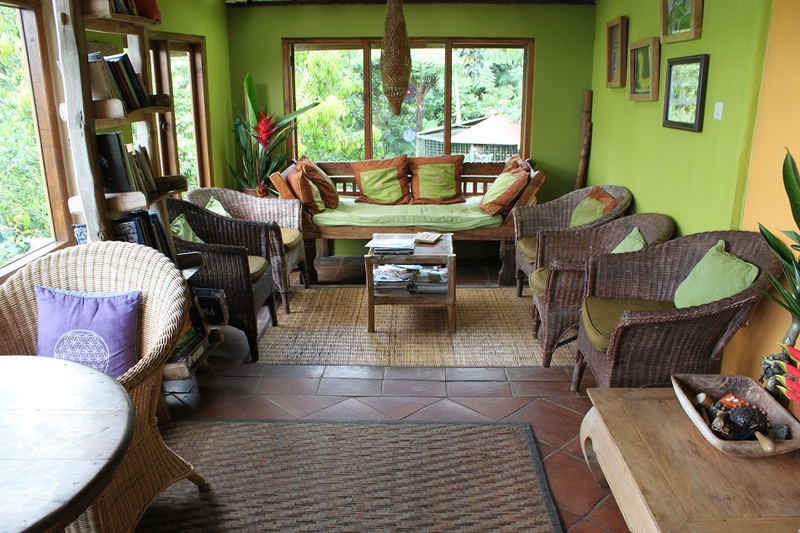 Before coming to the eco lodge we had already planned to take its cooking class, but during our stay, and after some delicious vegan dishes I eat at the restaurant, we know the cooking class will be an interesting one. Made, a more serious-looking but no less friendly cook, is the one who teaches us to make Balinese nasi campur – rice with several dishes on the side. Before us is a beautifully-arranged platter of ingredients I’m mostly familiar with except a white bulbous vegetable called bongkot. 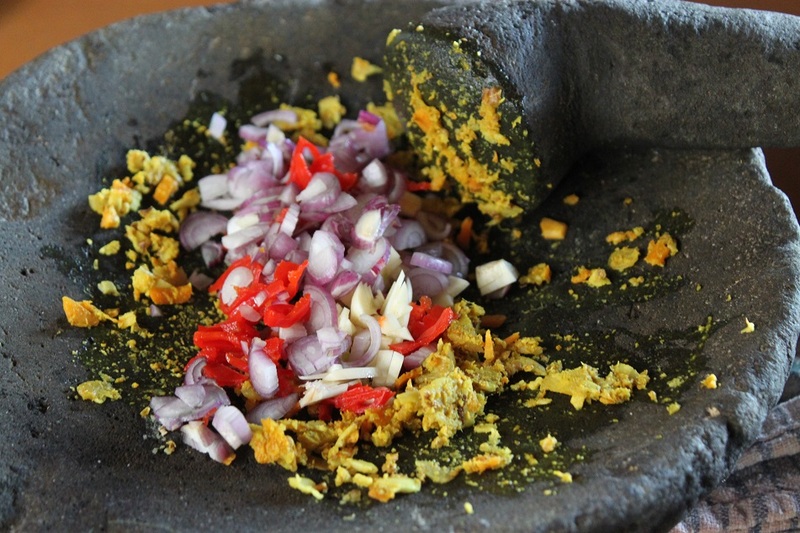 We start with making bumbu genep, a basic condiment for many Balinese dishes, using garlic, shallot, ginger, chili, turmeric, lengkuas (greater galangal), kencur (lesser galangal), and coriander seed. Perkedel jagung, or corn fritters, is the first dish we make, using bumbu genep to bind all the different ingredients together and give the fritter a punchy, rich flavor. Then we make chicken and chopped kaffir lime leaf in coconut milk, tofu cooked with chopped tomato and capsicum, and tempeh in kecap manis (sweet soy sauce) and palm sugar. Later we learn that the dinner we prepare is not only for us, but also for a Dutch couple who celebrate their 30th wedding anniversary in this secluded, peaceful place. I can only hope that I won’t disappoint them, and most importantly, Made. That night as we finish our desserts rain starts to pour. Bali’s highlands are known as a place where rain and clouds are something of a normality, as described by many drivers on our previous trips. But at this forest-surrounded accommodation I finally learn the consequences of living in such a pristine environment setting. As the rain stops, the dark forest and gardens are suddenly busy with different kinds of flying insects, all attracted to the lights at our bungalow, the restaurant, and everywhere else with light bulbs. 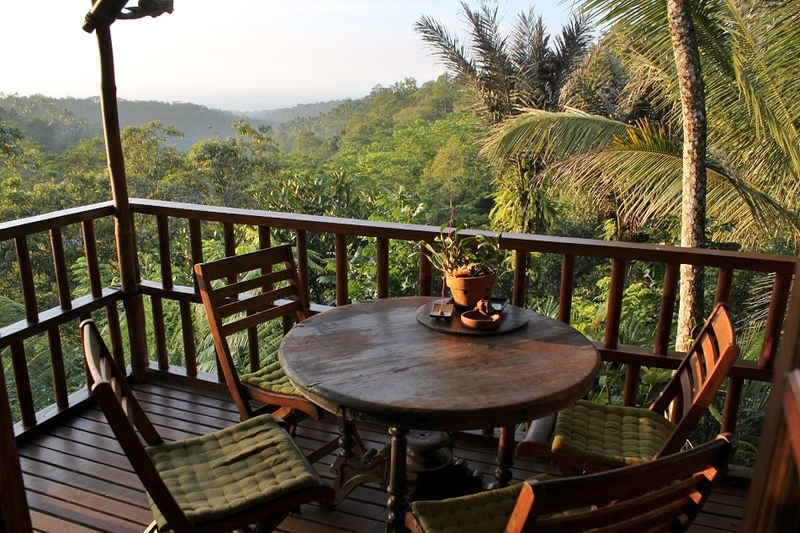 From the upper floor of our balcony – all windows and doors closed, most lights turned off – I watch in horror as swarms of flying termites and other critters fly frantically around the remaining lights downstairs, outside the bungalow. The biggest number of insects I have ever seen in my life, all painting invisible, dizzying flight patterns in the air. The next morning the lower floor of our bungalow is covered with dead termites, much to James’ disgust. 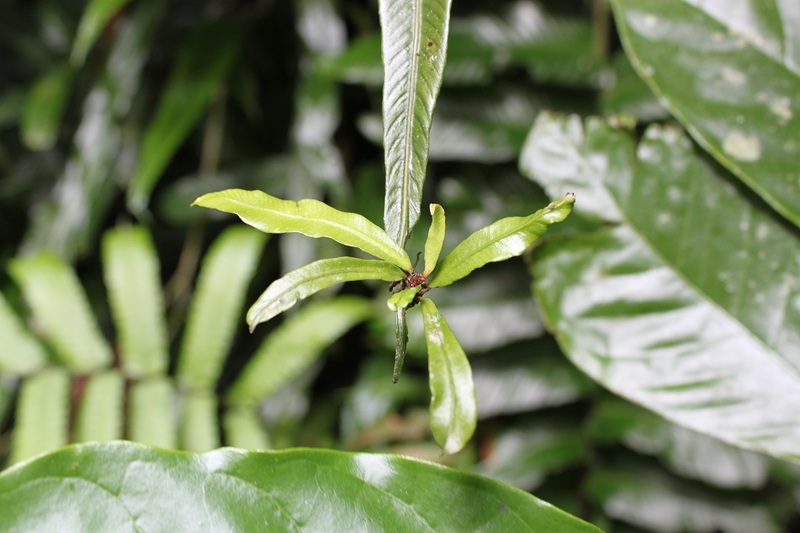 But such is the small price we have to pay to live in such a healthy environment, where we can breathe fresh air everyday, eat decent food made from the freshest of produce, wake up to the sound of lutung every morning and be lullabied by the sound of insects before going to bed every night. Such a small price for our well-being and sanity indeed. Hope you go there soon and enjoy it as much as I did! True, it’s a perfect place to escape the noise and hectic life of a big city. Plus it was also where I was introduced to a great variety of healthy vegan dishes. Suasana tenang, angin semilir, suara yang muncul bukan dari kendaraan bermotor tapi dari riuh rendah binatang di hutan, ahh… memang damai. Aku selalu tergoda untuk tinggal di pedesaan, tapi kadang masih belum bisa lepas dari ‘kenyamanan’ hidup di kota dimana segala sesuatu, kecuali udara bersih, mudah didapat. 🙂 Thank you, Halim. What a nice place to stay Bama. I would like to visit that Eco Lodge someday. So, bumbu genep is the main recipe for all Balinese dishes? How long it can be stored? She didn’t really say how long, but another driver told me that it could last for months. How many months exactly, I have no idea. Thank you for the reblog and for your kind words! What a complete Bali experience :)). And the only thing I know about Watukaru is the Watukaru Temple only–one of the six greatest temples in the entire island :haha. OK, I think I should explore the island more thoroughly, once I have time for doing so :)). Reading about it reminds me of my father–he is so experienced about all plants and flowers–and he is a great chef, too. I am usually asked to do the mortar and pestle thing whenever he wants to make dishes. Oh, I can’t wait for this July, because Galungan will arrive! 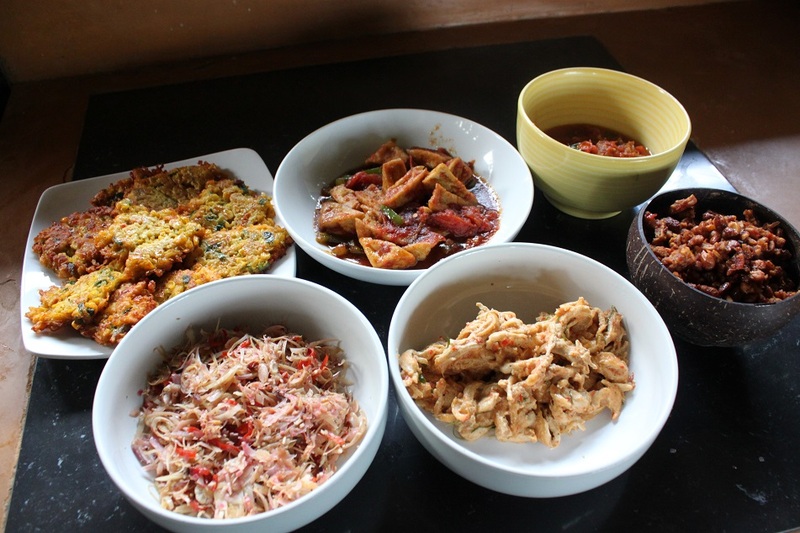 Base genep is one of the basic pastes in Balinese dishes, but it isn’t my favourite :haha. I like bawang jahe better! :haha. I’m always amazed by people who know the names of plants and animals, especially those living not far from they live; that makes me wish I paid more attention to taxonomy or biology class in general. Where will you celebrate Galungan? Will you go back to Bali? I never heard of bawang jahe paste. 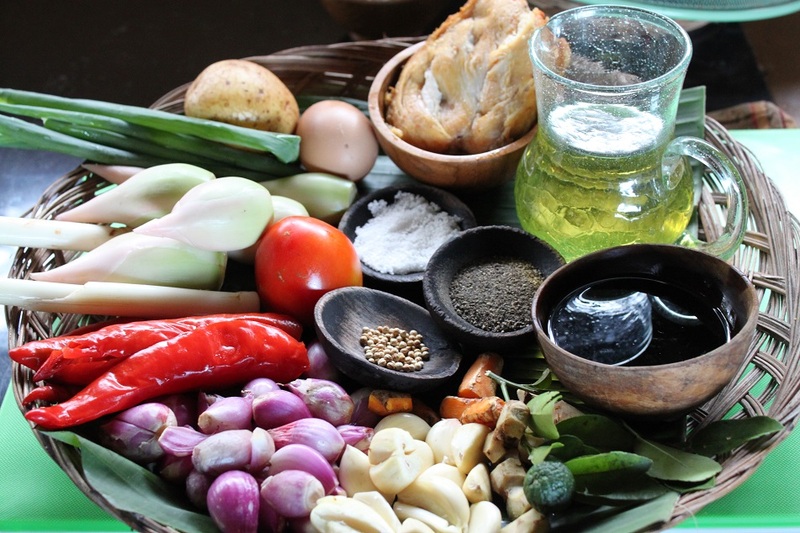 Which Balinese dishes are made using those condiments? I haven’t gone to that temple before, but as the Top 6 in Bali, I think you have to go there, Mas :hehe. Yes, and I am amazed too when they know the local name of those plants and animals–it really helps when you want to buy something in the market but you don’t know how to call it :haha. This year I’ll go to Lombok, Mas :hehe. I celebrated it in Bali last year, so this year I should come to Lombok. Hm, just like base genep, it’s a basic paste so theoretically you could use it with anything–chicken or meat and they all will be tasted well :)). Noted! 🙂 Will you go to Rinjani as well? That trip/hike still is the most physically- and mentally-challenging thing I’ve ever done in my life. But the funny thing is now I actually miss it! 😀 Ahh, I see. I should look up those condiments the next time I try Balinese dishes. 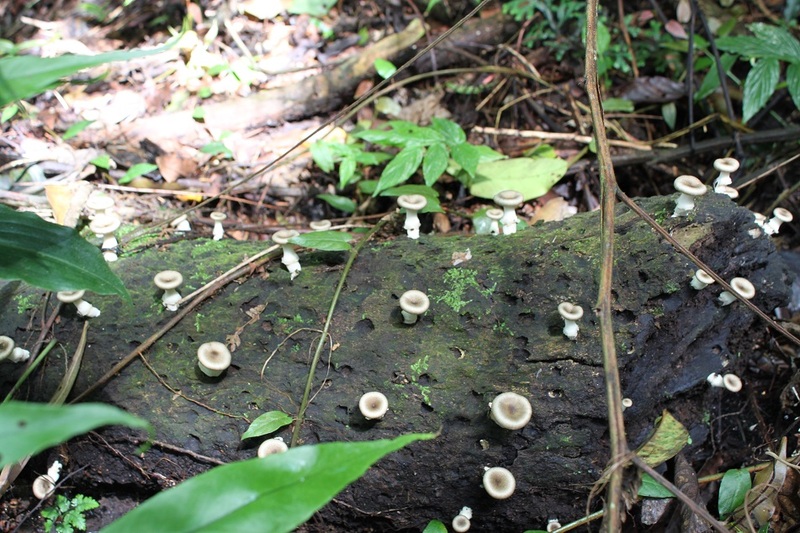 Such exquisite flora and fauna and beautiful documentation. Thanks for sharing, it’s so fantastic to be able to see such an in depth post about somewhere I’ve never been – you’ve inspired me! I wish I managed to take some photos of the bird, but my camera and lens were not powerful enough, and the thick canopy made any observation difficult. However it was a nice hike, indeed. Thank you for sharing your thoughts. Fantastic! But I have one question: “Dill, Fresh from the Tree”? 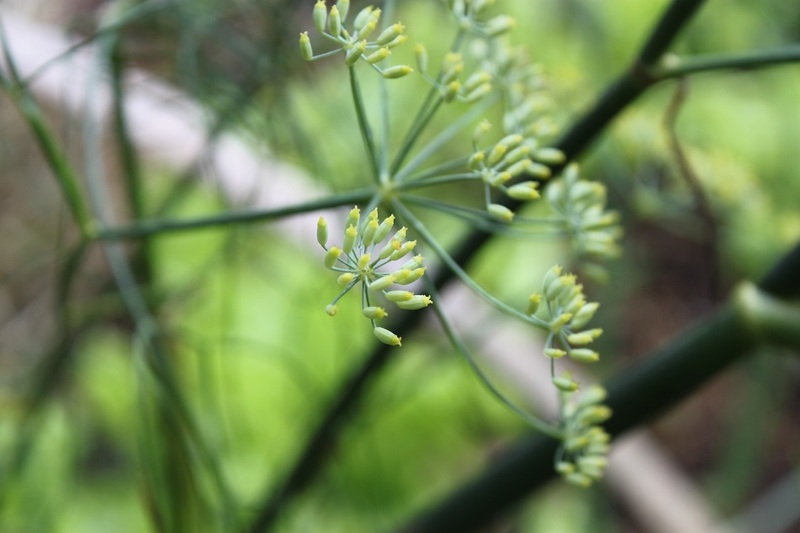 Usually dill is an annual herb? I just checked the info on dill, and you’re right. I guess when I went it happened to be just in time for harvesting. Your photos and description were wonderful; I feel like I’ve visited there myself! Thanks for NOT including photos of the leeches or the swarming (or dead) insects! What a wonderful journey on the road less travelled. The insects and leeches sound dreadful, and the cooking class wonderful, but best of all the forest walk with a guide who knows the plants. 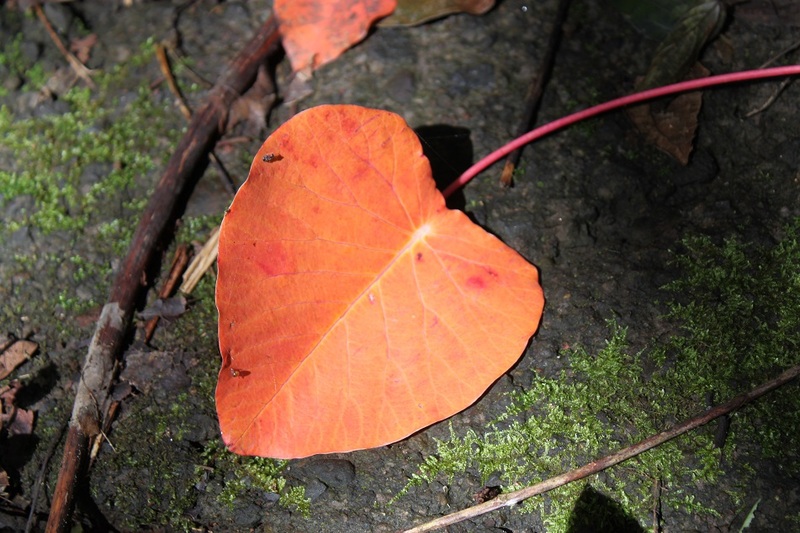 We did a similar walk in Laos and were lucky enough to have a botanist as our guide. It was fascinating. 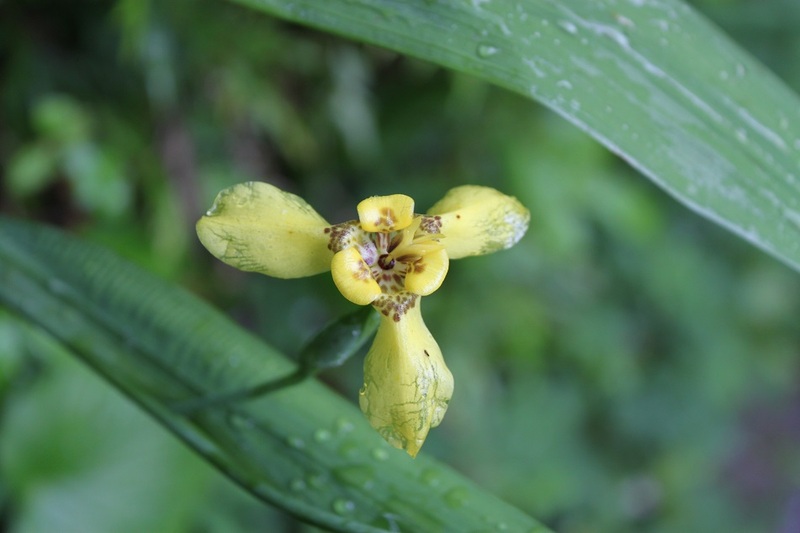 Like you, we saw many wild orchids – so beautiful. It really was wonderful, even though we didn’t see as many wild animals as we would have loved. 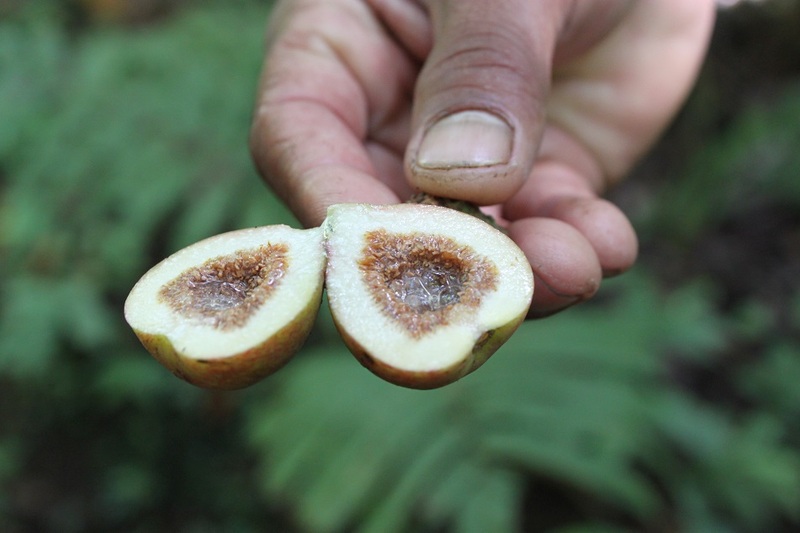 Our forest walk guide actually introduced us to wild rhubarb; it had this distinctive tart yet refreshing taste. As for the leeches, James was only bitten by one, while I probably three or four. 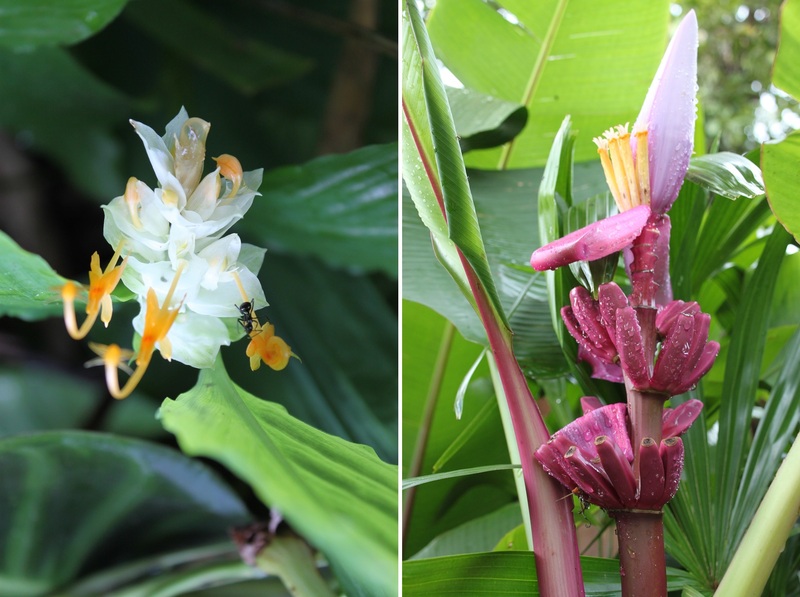 🙂 I really enjoyed your post and photos (especially the flowers and insects) from your walk in Laos, Alison. Hi Bama – nature, a wonderland, which you have beautifully captured. 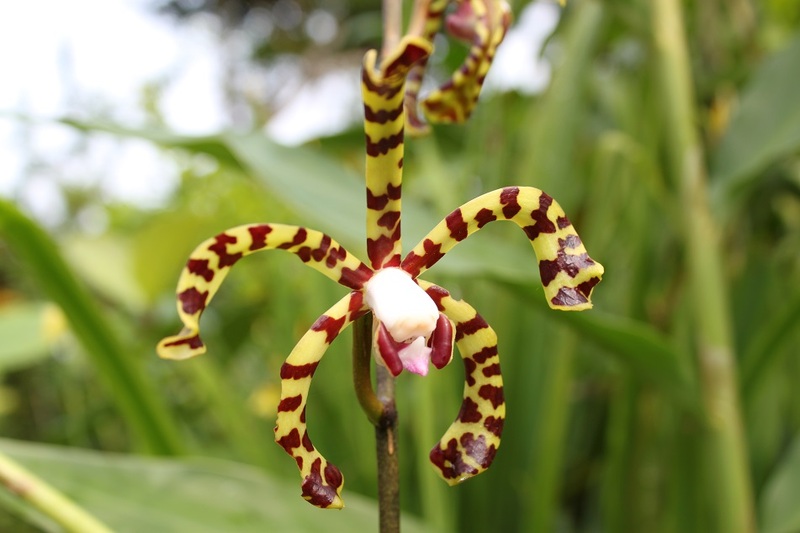 I enjoyed heart leave picture and the spider orchid. I found the spider’s eyes in there too. Thank you, Ruta. Nature truly is one big wonderland for us to enjoy with all the colorful flora and fauna. I had to look at that spider orchid photo again, and you’re right, it has the eyes too. Hello Bama! 🙂 I like your detailed articles, it’s like you bring us there also–with your lovely photos, so relaxing … I want to experience too. Hi Nicholas. Thank you for dropping by and leaving such a kind comment. In the Philippines I’ve only been to Manila, which reminded me so much of Jakarta. But one day I’ll make sure to revisit your country to explore its beautiful landscapes! So should I call you Nikko? One thing I noticed when I was in Manila, apart from its apparent similarities with Jakarta, was the abundance of Spanish colonial buildings which I personally think were more grandeur than the Dutch buildings in the Indonesian capital. I would love to visit El Nido, Banaue rice terraces, and Mount Mayon, among other places. Bohol is also on my wishlist. 🙂 Good luck with your studies and have a great trip afterwards! What a travelogue. I’ll have to soak my itchy feet in cold water. Wow Bama, I loved your macro shots of the flowers – my favourite is the one with the ant; its glistening black body really stands out on the white petals and orange stamens. In that photo the flower has the look and feel of glass! Your account and pictures brought me right back there… I was so glad I wore long socks on the forest hike while our bungalow had a broom downstairs. Sweeping a cloud of dead termites and broken wings into the grass is not something I’ll forget for a very long time! Wow, what a compliment, James! Thanks! I didn’t think much when I took that photo, so I was really lucky to capture that image just at the right time. The socks didn’t stop the leeches from biting my feet. I guess mosquitoes love you more, but I’m a big magnet for leeches. 🙂 Yea, I remember how it looked like downstairs the next morning. I had to tiptoe to the bathroom. Truly feast for the eyes, and the best thing is they provided us with the freshest of meals. Great shots. I like all the images. I recall when I was in village the inedible fruit that you posted here has a really tall tree. Rileks, pake banget. Perjalanan ke sananya cukup susah dan panjang sih, tapi sepadan sama apa yang didapatkan. Another reason for you to visit Bali I guess. 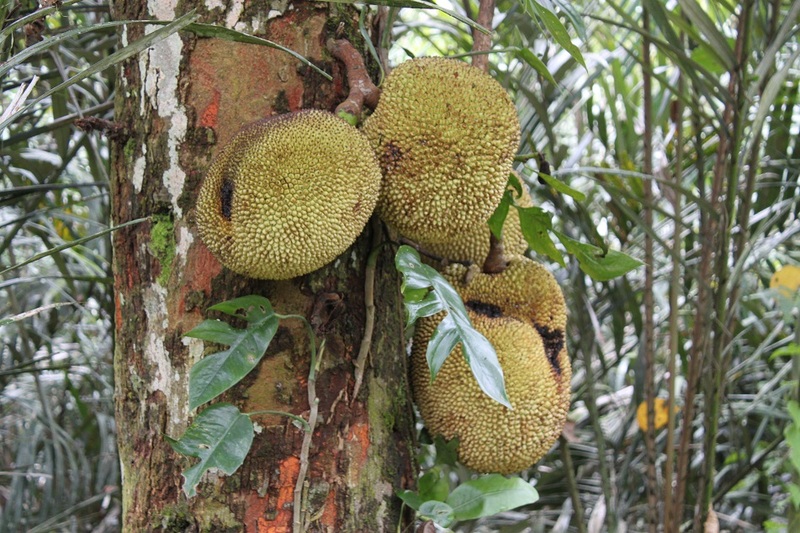 😀 Actually here in Java we have a very popular dish made from young jackfruit. I wonder if there’s Indian influence on it. Thanks Madhu! Hi Bama, it must have been refreshing to a visit this place away from the usual tourist bustle of Bali. 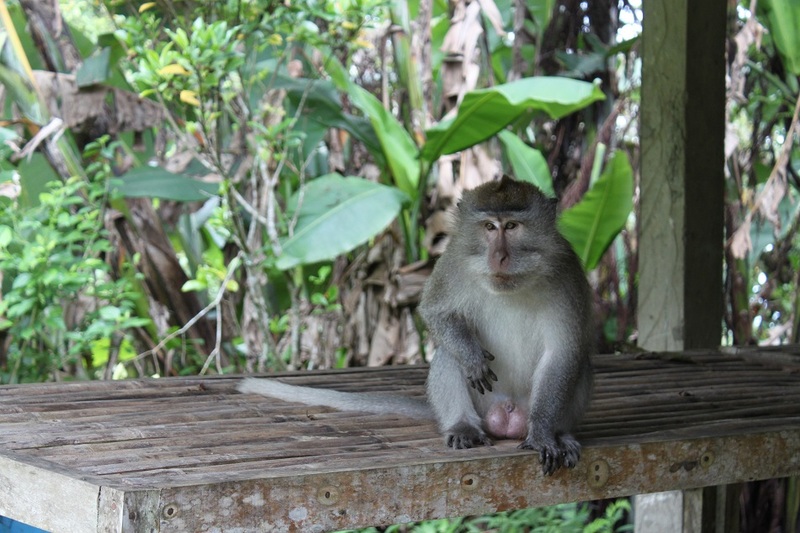 It’s wonderful to know that there’s still pockets of Bali that are not too dependent on tourist money. What a wonderful eco-lodge. The vegetations are incredible. I was transfixed with those beautiful orchids. I have not seen those varieties before. 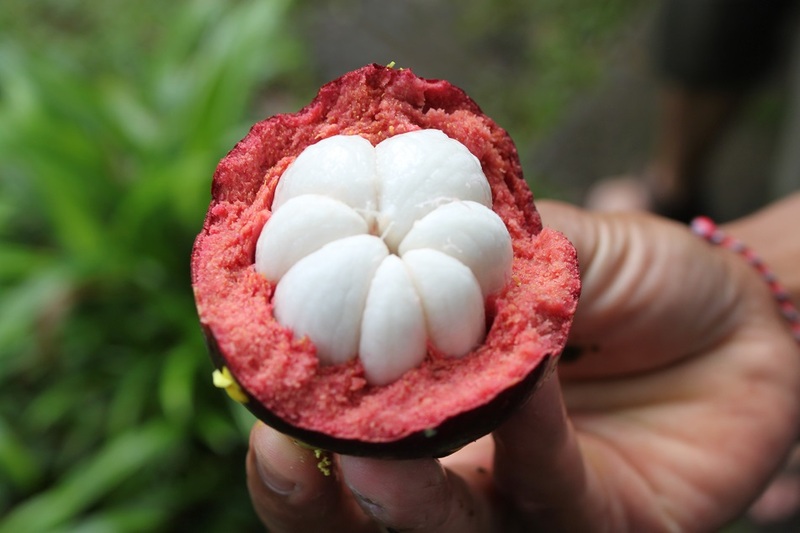 And those fruits – it was delightful to see the familiar ones and the unfamiliar. Ah, that cooking must have been a great experience. You’re finished products look so delicious. I’m sure the Dutch couple found it special. I hope to make it to his place when I visit Bali in person, although you already made me feel transported through your lovely photos and narratives. I wish I had the whole week at the eco-lodge as it was very refreshing, rejuvenating, and inspiring. That short stay provided me with the idea of having my own garden one day so whenever I need salad, all I have to do is go to the garden and take anything I want. 🙂 I really hope the Dutch couple liked it, as much as I enjoyed eating it. 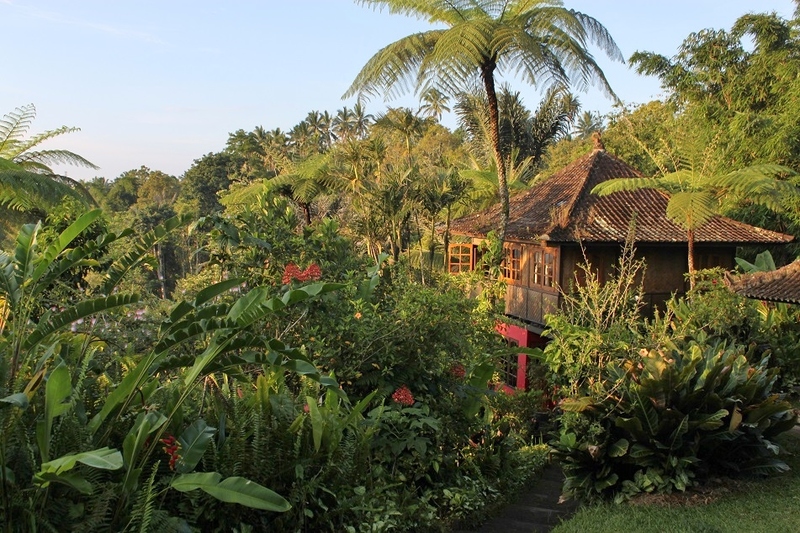 Marisol, Bali surely has pockets of tranquil places like this for those who want to stay away from the hustle and bustle. This really sounds like a place I would love to visit. I’m traveling to Asia in september, so I might put this location on my bucketlist. Your pictures are wonderful by the way. Nice touch to the reading. Hi JC. Visiting Bali in September should be great as it’s past peak season but it’s still in dry season, which is the best time of the year to visit the beaches. Thank you and have a great journey to Asia! Hi Tom & Kat. If you want to experience Bali at its best, try to avoid going in peak season. Hope that helps, thank you for reading, and good luck with your trip! Such a wonderful place. It is amazing how different and beautiful places can be around the world. Batukaru really is a special place. I would go back to that part of Bali in a heartbeat. 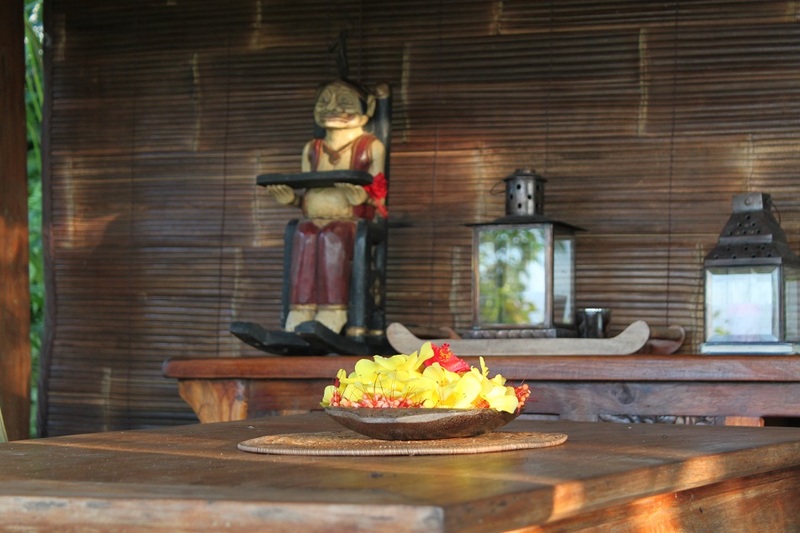 It’s always better to book in advance as there are only a few lodges available. It’s far from everywhere, but it’s really worth it. Wow, I want to be there! You should! It’s a perfect place to find peace and tranquility. What an amazing world indeed! So much to see and doooo! So much to see and do, so many dishes to try, so many cultures to learn, so many gems to explore. It’s such a wonderful world. If only we could see it all!! 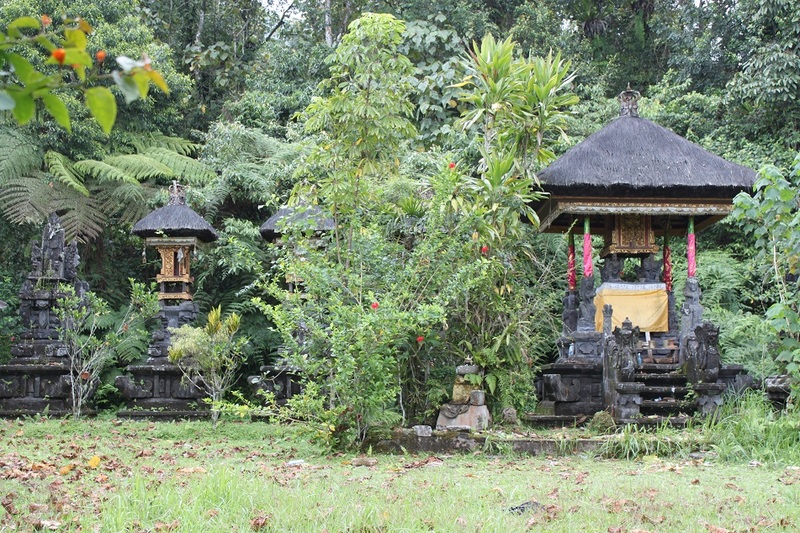 One of the best places in Bali to find tranquility.